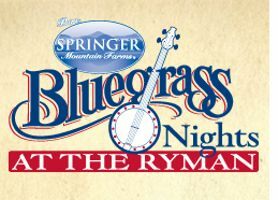 Myrtle Beach, SC -- Doyle Lawson & Quicksilver, Dailey & Vincent, The Spinney Brothers and IIIrd Tyme Out headline this terrific talent lineup announced by promoters Adams Bluegrass, LLC, for the 44th Annual South Carolina State Bluegrass Festival, the Palmetto State's oldest, largest, and best bluegrass event. The Thanksgiving weekend extravaganza of family fun and American music is slated for November 28-30, 2013, at the Myrtle Beach Convention Center, located at 2101 North Oak Street. This is the world's premier late fall Bluegrass Festival. This indoor show draws fans from throughout the eastern half of the United States and Canada for a "Who's Who" array of traditional bluegrass talent.